What we call a shooting star is actually a kind of space debris called a meteorite. 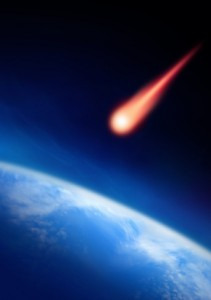 When a rock is floating in space, it is called a meteoroid, and when the meteoroid enters earth’s atmosphere, it travels so fast that it burns up. If and when it lands on earth, it is called a meteorite. Meteoroids form when two asteroids crash into each other and break into little pieces, or when comets shed dust debris, which collects as small meteoroids. Also, meteoroids can form from blasted parts of the moon or Mars. When a meteorite falls to earth, it can destroy land by creating craters. Meteorites range in size. They can be as small as your hand or as big as your house. Meteor showers occur when many meteors appear in the same place in the sky. Meteor showers are typically visible when the earth goes through dust debris from comets. On November 17, 1833, many people in North America witnessed a historic meteor storm—200,000 meteors per hour that lit up the sky. When we wish on shooting stars, we are actually wishing on burning meteoroids from outer space.